When the WOW team travelled to Malawi this past March, they had the pleasure of meeting Jacob and his wife Nya (her name has been changed for privacy) who shared their powerful testimony of transformation. Jacob was an alcoholic and a very violent man. He would often return home drunk and was terribly abusive towards Nya and their children. Out of fear of the harm she and her children would face if they remained within their home, Nya would often run away. Nya, and her children, would stay with friends to avoid being home at the same time as Jacob while he was drunk. Other times, she would sleep in the bathroom when he would return home to ensure her safety and that of her children. In addition to physically abusing his family, Nya indicated that Jacob would spoil all of their food with the intent of starving them. Over time, Nya could no longer handle this violence towards her family in silence and decided to reach out to the gender based violence team leader in her community. She shared with them about the state of her marriage and the terrible abuse she was facing. The leader invited Nya to join our partner’s GBV support groups with other women who have endured abuse. They offered her emotional and spiritual support in a group setting. The GBV support groups also provide support services for abusers. After Nya began attending the GBV support group, Jacob had a dream. In his dream, he confessed to Nya that he had done wrong to his family and needed to change his behaviours. Nya informed him in his dream that he needed to seek out support. She spoke truth over Jacob and indicated that the only way he could change his habits was if he chose to give his heart to the Lord and asked for forgiveness for the things he had done wrong. After having attended the support group on her own, Nya felt compelled to ask Jacob to join a group in order that he would have the opportunity to learn more about what constitutes a healthy family life. Little did she know that God had already started to soften Jacob’s heart. When Nya asked, Jacob agreed. After attending for a few weeks God began to do an amazing work in Jacob’s life. As counsellors facilitating the support groups discussed violence, abuse and child protection, he began to recognize that his behaviours towards his family did not align with the way in which a husband ought to treat his wife and family to foster positive family dynamics and growth. From that moment forward, Jacob surrendered his life to Jesus. Not only did Jacob wish to change the way in which he treated his family, he also wished to encourage others within his community and the surrounding communities to begin to question their behaviours towards their families and women in particular. As a result, Jacob joined our partner’s gender based violence awareness team. After having worked through deep hurts and challenges within his own life through support groups, Jacob and Nya participated in gender based violence awareness training. This training, offered by our partner in Malawi, helps to equip locals who wish to minister within communities, churches, schools and local police authorities surrounding the current issue of gender based violence. This gender based violence awareness program, started with 16 individuals. There are now 150 individuals a part of this team! Teams go and evangelize and facilitate discussions surrounding family issues and gender issues with community members as well as community chiefs. Through these conversations, new precedents have been set surrounding acceptable behaviours towards women and children. These teams are working to encourage a greater male involvement in gender based violence awareness and education within communities. Jacob, along with other men on the team, have endeavoured to facilitate greater discussions with other men in their communities and surrounding communities under their responsibility. After having developed a new level of respect for the women in their lives through support groups, they now wish to offer other men with an alternative perspective surrounding the treatment of women and children within their households and communities at large. They wish to use their previous life experiences to help others to see the importance of loving and treating their wives and children with the respect and support they deserve. God saw the potential and the reach that Jacob’s testimony would have within his community. 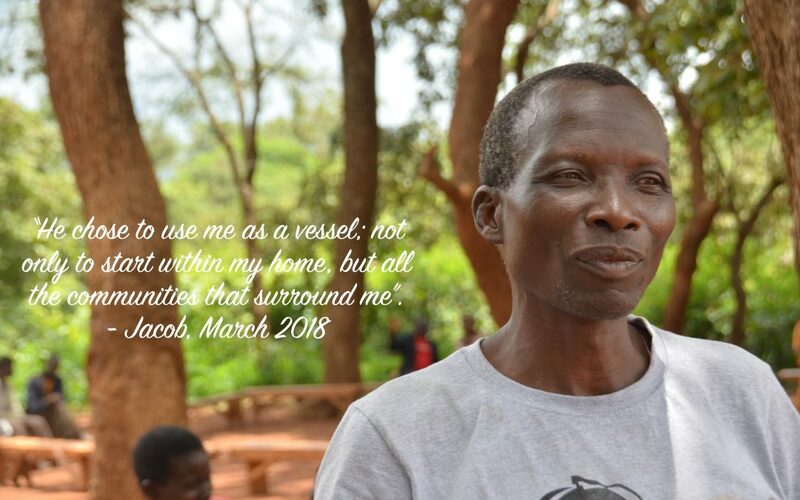 Jacob explained that “He chose to use me as a vessel not only to start within my home but all the communities that surround me”. God used Jacob’s previous lifestyle to reach other families where men continued to treat their wives and families poorly. Individuals knew the terrible man he once was and were completely amazed by the miraculous transformation they saw in his life. They began to see that if God could restore his family and their marriage, He too could restore their families and marriages. They came to understand that if Jacob had chosen to alter his behaviour towards his family, maybe they too needed to change their ways. Jacob and Nya also play an important role on the gender base violence awareness team as a married couple. They travel from community to community; facilitating discussions together with other couples they have developed relationships with surrounding the topic of gender based violence and healthy family dynamics. Jacob indicated time and time again that “through the ministry to his wife, the ministry changed me”. Nya too has explained that she is now happy and peaceful. She is grateful for the gender based violence services that were made available to her and her family. She no longer lives in fear of her husband and their children are now full of joy.